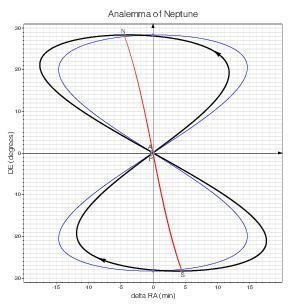 This page attempts to explain the notions of equation of time and analemma that underlie the elegant curves represented below, familiar to anyone with a passing interest in astronomy. The explanation starts from basic principles and gently introduces necessary astronomical notions along the way. 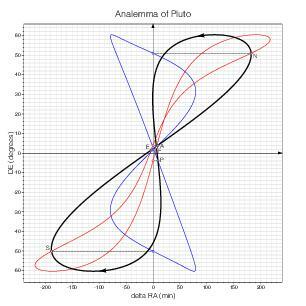 The equation of time and analemma curves for the other planets of the solar system (and Pluto) are shown at the bottom of the page. The measurement of time is based on the observation of some periodic (or nearly so) phenomenon chosen as reference. The succession of nights and days and the repetition of the cycle of seasons, that we attribute to the rotation of the earth on its axis and the revolution of the earth around the sun, are two important such phenomena. They still dominate the definition of civil time scales even though the official definition of the second has been based on atomic phenomena since the 1960's (ESAA [1, p. 10]). From the point of view of a terrestrial observer, the cloudless sky looks like one half of a sphere of immense radius centered at the observer and to which the celestial objects appear to be attached. This celestial sphere appears to rotate from east to west around a fixed axis, the axis of the world, passing through the observer and the celestial pole, the visible point of the celestial sphere unaffected by the rotation (if the surface of the earth were not in the way, two poles would be visible, opposite to each other with respect to the observer). Objects near the celestial pole, such as the Pole Star in the northern hemisphere, remain almost unaffected by the rotation. In this model, the succession of nights and days results from the effect of the rotation of the celestial sphere on the sun. Each point of the celestial sphere distinct from the poles defines a meridian plane, the half-plane bordered by the axis of the world and containing the point. The meridian plane containing the zenith of the observer (the point of the celestial sphere directly overhead) has special importance, it is called the meridian plane of the observer*. 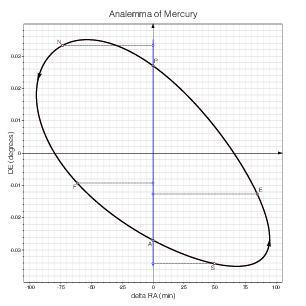 The rotation of the celestial sphere can be measured precisely at a particular location on earth by determining the instant of culmination (maximum altitude with respect to the horizon) of some reference celestial object on successive days. At that instant, the object lies in the meridian plane of the observer. Any other instant between culminations can be evaluated precisely by measuring the angle between the meridian plane of the observer and the meridian plane of the reference object. The angle between two meridian planes can be measured along the celestial equator, the intersection of the celestial sphere and the equatorial plane, perpendicular to the axis of the world through the observer. The angle between the meridian plane of the observer and the meridian plane of a celestial object, measured from east to west, is called the hour angle of the object. It is measured in hours, minutes, seconds, 24 hours for a whole turn. It increases steadily from one culmination to the next, returning to 0 at each culmination. 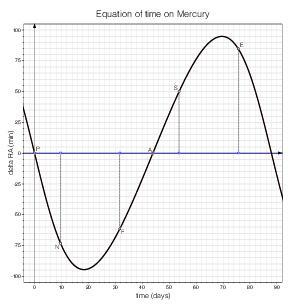 If the reference object is a star or some fixed point of the celestial sphere, then the hour angle is a measure of local sidereal time. The conventional reference point for sidereal time is the vernal point, the point of the celestial equator where the sun lies at the March equinox. 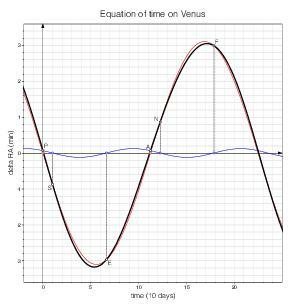 In other words, local sidereal time is defined as the hour angle of the vernal point. Finer notions of apparent and mean sidereal time have been introduced in order to account for the motion of the vernal point itself, due to variations in the earth's axis and the plane of its orbit around the sun (the terms precession of the equinoxes and nutation are related to this), but this is beyond the scope of this page and does not affect the basic facts surrounding the equation of time. Details can be found in ESAA . 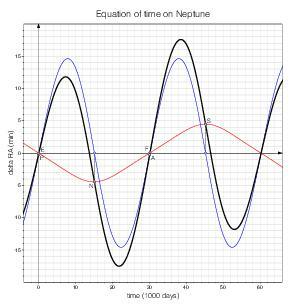 Sidereal time is preferred by astronomers. Before the advent of modern technologies, they would use pendulum clocks synchronized with the culmination of a reference star to evaluate the sidereal time of their observations. As long as the position of the reference star with respect to the vernal point is known (at least the angle between their meridian planes), the clock can be adjusted so that 0 hours corresponds to the culmination of the vernal point. In our current view of the world, we attribute the rotation of the celestial sphere to the rotation of the quasi-spherical earth on its axis. This rotation is a very uniform motion. It accords well with other reference periodic phenomena such as the oscillations of a pendulum. It was used until the 1960's as the basis for the definition of the independent time variable of the equations of Newtonian mechanics. By then, it was discovered that the rotation is slowing down and that a better time scale was needed (again, see ESAA  for details). The angle between the meridian planes of the vernal point and a star, measured from west to east (unlike the hour angle), is known as the right ascension of the star. It can be measured along the celestial equator. Like the hour angle, it is measured in hours, minutes, seconds or decimal hours. The declination of the star, on the other hand, is the angle between the celestial equator and the star, measured along the star's meridian, the intersection of its meridian plane with the celestial sphere. The declination is positive for stars to the north of the equator and negative to the south. 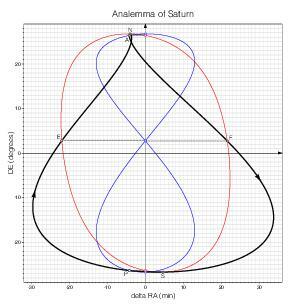 The right ascension (α) and declination (δ) are the equatorial coordinates of the star. 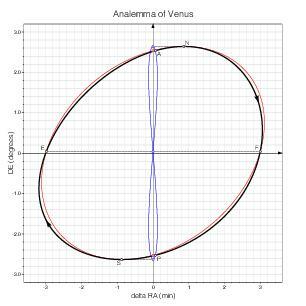 Right ascension and declination constitute a coordinate system on the celestial sphere, similar to the geographical coordinate system of longitudes and latitudes used on earth. Equatorial coordinates apply of course to any point of the celestial sphere, not just stars. The sun can also be used as reference object for the measurement of time. Its hour angle measures (local) solar time, more precisely true solar time (the nuance will be explained below). This is the quantity read by a sundial. Solar time differs from sidereal time because the position of the sun on the celestial sphere is not constant with respect to the background stars. The sun appears to move along a great circle of the celestial sphere called the ecliptic, completing a whole turn in a year (that is the definition of the year, the notion of sidereal year anyway). The sun progresses every day by about 1 degree of arc along the ecliptic (360 degrees in about 365 days), from west to east. In our heliocentric view of the world, since Copernicus, we attribute the motion of the sun along the ecliptic to the revolution of the earth around the sun. This motion of the sun along the ecliptic causes solar time to shift with respect to sidereal time by about 4 minutes every day (24 hours in about 365 days). A solar day is longer than a sidereal day, because the earth has to rotate a little more every day with respect to the stars in order to catch up with the sun. 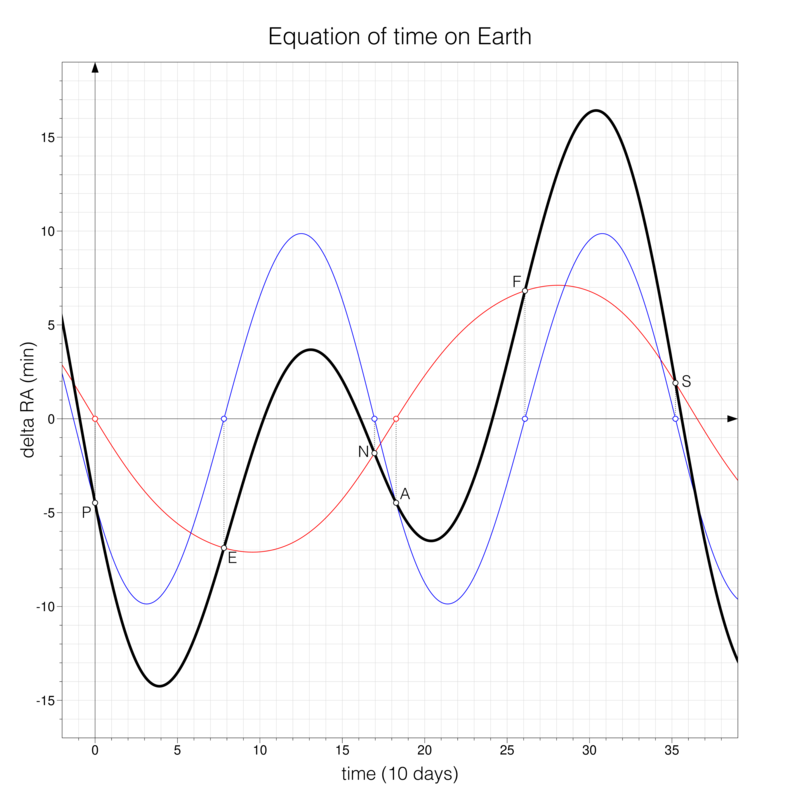 If sidereal time were used as a standard for civil time, daylight and our biorythms would slowly shift with respect to the clock, which could be confusing. 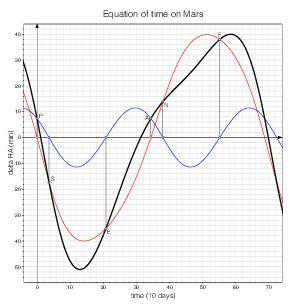 It makes more sense to use solar time as reference for civil time. The difference between true solar time and sidereal time is the difference between the hour angle of the sun and the hour angle of the vernal point, which is precisely the right ascension of the sun. If the right ascension of the sun varied uniformly (with respect to a sidereal clock) over the course of a year, it would be sufficient to change the length of the second (by changing the length of the pendulum, for instance) to transform a sidereal clock into a solar clock. 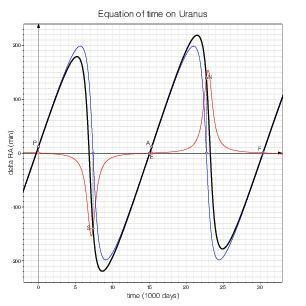 However this variation is not uniform, for two independent reasons: the inclination of the ecliptic with respect to the celestial equator, and non-uniformity of the motion of the sun along the ecliptic. 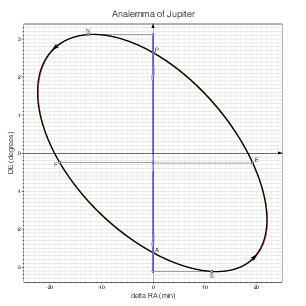 The plane of the ecliptic makes an angle of about 23.5° with respect to the equatorial plane (from a heliocentric viewpoint, this is the complement of the angle between the axis of the earth and the plane of its orbit around the sun). The ecliptic intersects the celestial equator at the equinoctial points where the sun lies at the equinoxes: the vernal point and the autumnal point corresponding respectively to the spring and fall equinoxes in the northern hemisphere. The motion of the sun along the ecliptic translates into a variation of its right ascension (through its projection onto the celestial equator along meridians) and a variation of its declination (its height above or below the equator). The variation in declination causes the seasons (when the sun is north of the celestial equator, for instance, it provides more heat to the northern hemisphere by staying longer and rising higher above the horizon) but it does not not affect solar time. 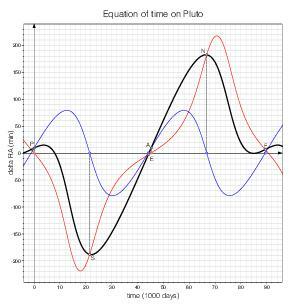 Solar time is only affected by the variation in right ascension. 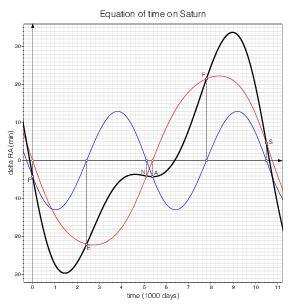 Even if the motion of the sun along the ecliptic were uniform (which it isn't, see below), its right ascension would not vary uniformly, due to the inclination of the ecliptic. This is easily understood by comparing the situations at the solstices and the equinoxes. Around the solstices, the ecliptic is almost parallel to the equator and an angular displacement along the ecliptic projects onto almost the same displacement along the equator. Around the equinoxes, on the other hand, the ecliptic makes its steepest angle of about 23.5° with the equator and a given displacement along the ecliptic projects onto a shorter displacement along the equator (the ratio being the cosine of 23.5°). 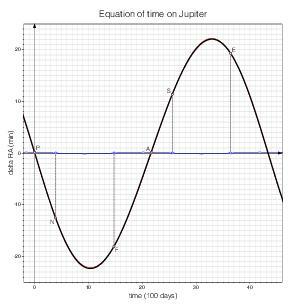 This shows that, assuming a uniform motion of the sun along the ecliptic, the variation of the sun's right ascension cannot be uniform. It is faster around the solstices and slower around the equinoxes. In addition, the motion of the sun along the ecliptic over the course of a year is not uniform either. The ancients were well aware of this fact, from the simple observation that the time elapsed between a spring equinox and the following fall equinox (approximately 186 days, 14 hours, 20 minutes) differs from the time elapsed between the fall equinox and the following spring equinox (approximately 178 days, 18 hours, 29 minutes), while these points are separated by 180° along the ecliptic. Since their cosmological model assumed that the sun traveled on a circle around the earth at uniform velocity, they had concluded that the earth was not positioned at the center of this circle but eccentric with respect to it (Delambre [2, p. 5]). 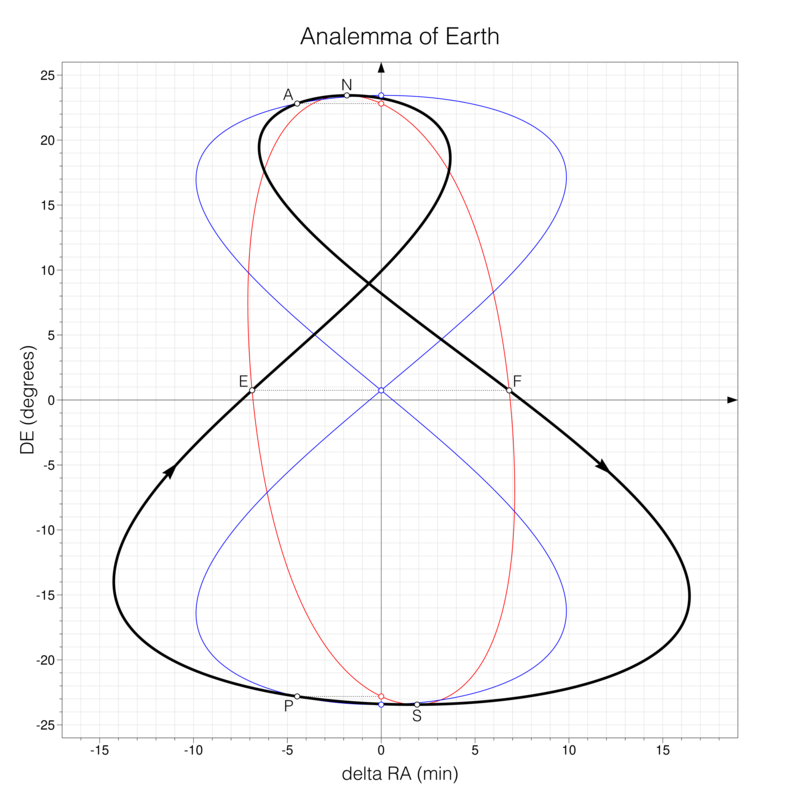 The shape of a planet's orbit and the relative position of its rotation axis affect the appearance of the equation of time and analemma curves in surprising ways. 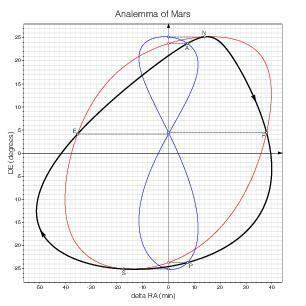 The curves associated with the other planets of the solar system (and Pluto) are shown below. 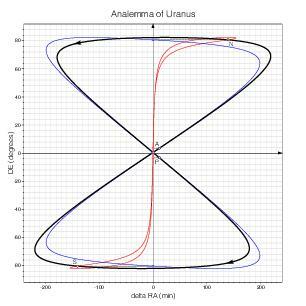 S. E. Urban & P. K. Seidelman, Eds., Explanatory Supplement to the Astronomical Almanac, 3rd Edition, Mill Valley: University Science Books, 2013. Jean-Baptiste Joseph Delambre, Astronomie Théorique et Pratique, Tome II, Paris: Courcier, 1814.